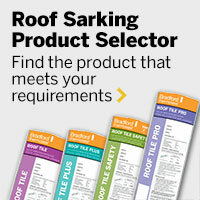 It is mandatory under the Building Code of Australia (BCA) that all tiled residential roofs, regardless of roof pitch, with a rafter length greater than 6 metres must be sarked. CSR recommends that all tiled roofs with a pitch of less than 20° are sarked and the BCA mandates this requirement for rafter lengths greater than 4.5 metres. As a general guide, it is considered good building practice to sark all tiled roofs as it helps to address the requirement within the BCA to protect the building from the entry of external moisture. Every new home built or renovated must undergo a BAL (Bushfire Attack Level) assessment. If your home is required to comply to a BAL-12.5 to BAL-40 area classification, incorporation of sarking with a flammability rating ≤5 is mandatory. For Flame Zone (FZ) areas, sarking is still required but additional precautions must be taken and the Bradford Bushfire Roofing Systems Design Guide should be consulted.